Under Armour 3pk Girls’ Mystery T-Shirt Just $24! Was $50! FREE Shipping! 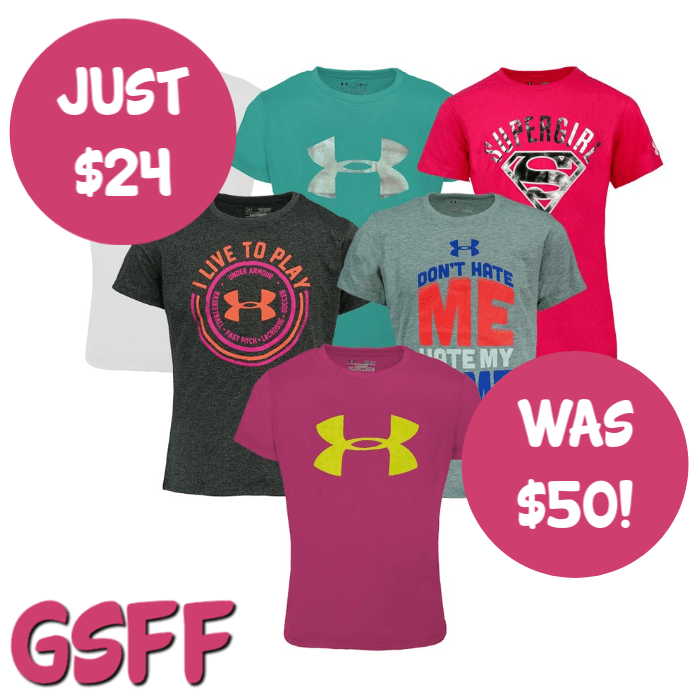 You are here: Home / Great Deals / Under Armour 3pk Girls’ Mystery T-Shirt Just $24! Was $50! FREE Shipping! Under Armour 3-Pack Girls’ Mystery T-Shirt Just $24! Down From $50! FREE Shipping! You can score this Under Armour 3-Pack Girls’ Mystery T-Shirt for just $24, down from $49.98, when you use the promo code PZY24 at checkout PLUS FREE shipping! Three shirts for the price of one! This is the highest quality of shirts Under Armour has to offer! Get this 3-pack of assorted tees for your daughter or sister to use or give them as a gift for the upcoming holidays. Bundles will include Tech Big Logo V-Neck, Big Logo Tech shirts and many more.